One of the perils of blogging about parenthood is that it’s easy to get wrapped up in your own world. Family life is by its nature insular. Caroline and I have 800 square feet of living space to our names right now (it’s about to get bigger, though, when we move to “the Mich-gan” as Jay likes to call it) and in that small space a lot goes on each day that no one sees but us. We’ve got our family jokes, our serial frustrations, our patterns and habits that unfold on a closed-circuit loop. It’s also true that with parenting, as with any intense emotional experience, it’s hard to imagine that other people—in fact a lot of other people—are feeling and have felt the exact same things you do. Before Jay and Wally were born I’d never felt what it is to love someone so completely and totally as I love them. And because I’d never felt that before there’s some inadequate gland in my brain that has a hard time reckoning that anyone else had ever felt it either. So that’s why today I am inaugurating a new series on Growing Sideways: The Parent Interview. Parenting is one of the most significant experiences anyone has in a lifetime and it’s also one of the most universal. So it made sense to me that on this blog there should be other voices besides my own. In the coming months I’ll be reaching out to parents I know at every stage in the parenting process and I hope, as the audience for Growing Sideways continues to increase, I’ll meet new parents and be able to incorporate their voices, too. 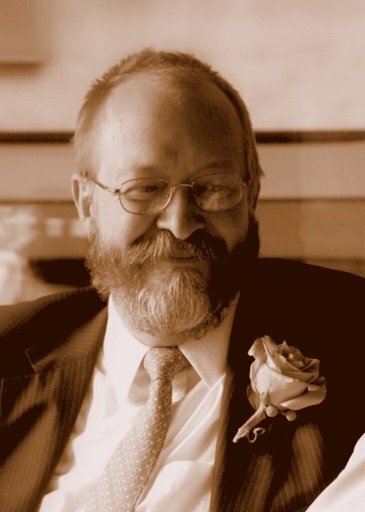 Today The Parent Interview series begins with John B., a man I’ve known for going on 20 years. On the first day of sixth grade in 1992 John’s son Andrew sat down next to me in Social Studies. He’d just moved to Freeport from out-of-state and we became fast friends. 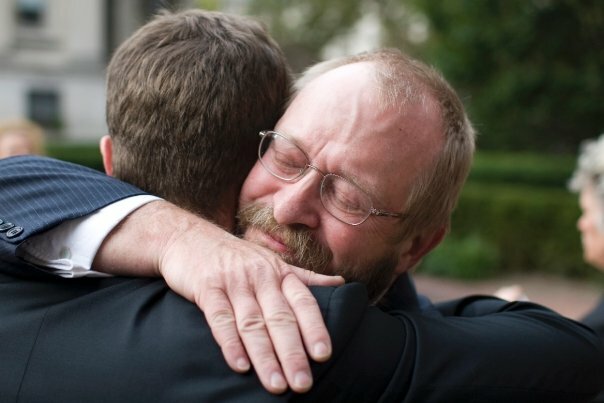 In 2008 he stood alongside me as I waited for Caroline to walk down the aisle. A year later I did the same for him as he waited for his bride Carey. Along the way I’ve gotten to know John pretty well. He’s a lively spirit with a twinkle of mischief in his eye. He’s also a dad who loves his two sons—Andrew, 30, and Michael, 27—deeply. In the following interview you’ll see some of both come out—the love and the mischief—as John talks about deciding to go back to school to “make something of myself” after his first child was born, about what it was like to parent after a divorce, and about how his taste in music has slipped since his two boys left the house. 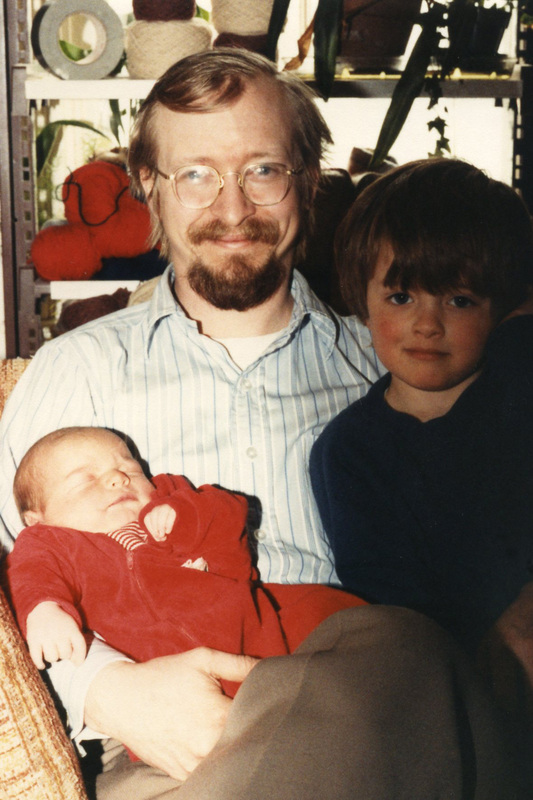 Reading John’s interview, I found there were moments in which his experience as a dad resonated like words straight out of my own mind, and other places where I gained a new perspective on a familiar quandary. It was a nice reminder, to me, that no two parenting experiences are completely the same, nor are they completely different. 1. Tell me a little bit about where you were in life when you had Andrew—where you were living, what you and Clarissa were doing, what life felt like at that moment. We were living in her house in Bath, Maine, a house she had purchased from her grandmother. Clarissa was an elementary school art teacher and I was a city employee in the town garage. My co-workers were drunks and ne’er-do-wells who wandered about the town garage with coffee laced with coffee brandy getting in fights at work and regularly playing hooky from snow plowing. In this environment I was a star performer. Clarissa pretty much disliked teaching, though she was good at it, since the little brats drove her crazy. Life was great. Andrew was a delight. Clarissa has a great family and we were fairly close to them physically and very close socially. Andrew, by dint of arriving and expecting to eat and be clothed, convinced me to go back to college and make something of myself. So I enrolled at the University of Maine and got to be an engineer. Clarissa has a great sense of humor and is the cheapest person above ground. I also have a sense of humor and am the cheapest person above ground. We got along pretty good. John in Orono, Maine in 1984, when Andrew was 3 and Michael was 1. 2. Is there a particular memory, or thought, that stands out from those first years as a father? Oh, hundreds. The best one is that I still remember the feel of his little fingers grasping my one finger on his first walk around the block. No, wait, the best one is realizing that every day when I came home he came crawling to Daddy at top speed from wherever he was in the house. Squealing with delight, little legs just a pumping. As a 12-14 month old he used to dive into the cupboards, pull all the pots and pans out on the floor, sit in a cake pan, pull a ski cap down over his head to cover his entire face and beat on the pots with a spoon while he sang. It was REALLY funny. He used to love to ride my leg, ‘horsey’ style. He loved to bite my nose. He would walk between my legs and laugh like crazy. When he was a bit older he loved to drive his mother crazy singing the alphabet song with me over and over and over, loud as we could until she was ready to kill us. I could go on and on with this stuff. 3. Were there ways in which you tried deliberately to parent the way your parents had raised you? Or ways in which you tried deliberately to parent differently than your parents had? My mother was abusive. She had six kids and a real short fuse and she used to beat the hell out of me and the other younger ones. The two older got off pretty easily but by the time I came along the old girl was getting in over her head. At first I used to spank little Andrew but I quickly became ashamed of myself. Noodling it over I came to the conclusion that discipline involved taking away something the kid wanted. If spanking took away the feeling of ease, it could work. But if I was especially positive with the kid as a normal course of affairs, simply taking away the positive reinforcement that he enjoyed would act as well. So I resolved to be as positive, loving and doting as possible and to discipline him by withdrawing and ignoring rather than anything more punitive. It worked great. And to this day there has never been a day that I didn’t tell the kids that I love them and that they are the greatest kids in the world. On the days when that wasn’t especially true, I’m sure they felt the disappointment and were anxious to return to my good graces. I always tried my best to show the kids respect and to treat them as I would any grown person. Of course, at a certain point one has to pull rank when things get out of hand, but that happened pretty rarely. 4. Right now I’ve got this two-year-old who barely listens to anything I say. What should I do? Ask yourself why you are trying to reason with a two year old. Their brains can’t handle the task. They seriously have no concept of the needs of others. This will come later but at that age they are hopelessly self-centered. If he listens to anything, be grateful. If you need to get him out of something, he’s easily distracted. And he will forget most anything in a few minutes. And keep repeating this to him: “Jay! You must never, ever, ever disagree with your father. You must always say ‘Yes, father’”. I really doubt that this will work but if you repeat it gravely, intently and often it just might sink in after a long while. In the mean time it will lighten your mood and remind you of the absurdity of parenting an intransigent little boy. 5. And what about when he’s a teenager and still not listening…how’d you handle that? In my case, I was lucky. Both boys were very self-directed and as focused as I could have wanted. I rather felt that too much hard work as a child would make them drudges. Perhaps my wise choices in parenting made for good teenagers or maybe not. But since no one can disprove it, why shouldn’t I take credit? All right then, by god, I wisely parented my children and had an easy time with them as teenagers. Plus, when they were teenagers we were an all guy household. Which, I don’t need to tell you, can solve a lot of problems right there. 6. You got divorced when the boys were teenagers. What was it like adjusting to being the only adult in the house when you were taking care of Michael and Andrew? It was exhausting trying to hold a job, run a house and take care of them 24/7. And one goes through a lot of stress in a divorce which can tend to take it out of you. The stress got the better of me and I went looking for a counselor to sort things out. After many false starts, I found one that I clicked with and she taught me how to handle my feelings much better. It takes a long time to get through a divorce. I’m glad I had such good kids while I was at my weakest. 7. What would you say was the biggest misstep you made as a parent? Jesus Christ, Hartnett. That’s a question right out of the management interviewer’s guide to torturing prospective employees. Matter of fact I just got asked ‘What was the biggest mistake you made as a manager and what did you do to correct it?’ last week while I was trying to close the deal on my new job. But honestly, I should have taken more time away from work to do things with the kids. I ceded all the school activities to Clarissa and never got involved with those things because I was always working. And I never resolved the differences with Clarissa, which would have made for a much happier household. I can’t believe you wheedled that out of me but I should have known better than get into a battle of wits with a Harvard graduate. I’ve been blindsided! 8. Your kids are out of the house now. When you think back on those years when they were under your roof, how do you feel? You miss it? You glad it’s over? Ready to do it again? Miss it? Jesus, yes. I loved having them around. Those two are a lot of fun. I miss having them vet the music and introduce me to new stuff. I loved meeting their friends and hanging with those guys. And there is no one that will love you like your own kids (unless you blow it, of course). Michael in particular is one of the most truly loving people I’ve ever met. And Andrew is non-stop action. When he comes into the house there is music going on over here, a phone in his ear, the Internet going over there, a video game, great patter with everyone. They are just great people to be around. Glad it’s over? Hell no. I wish I lived around the corner from each of them. Ready to do it again? You mean have little babies? No, I don’t have the energy to keep up with them. Those little buggers just go and go and never stop. I’m too old for that now. But do I regret having kids, would I do it again? I regret nothing. They were and are about as good a set of kids as a man could have. 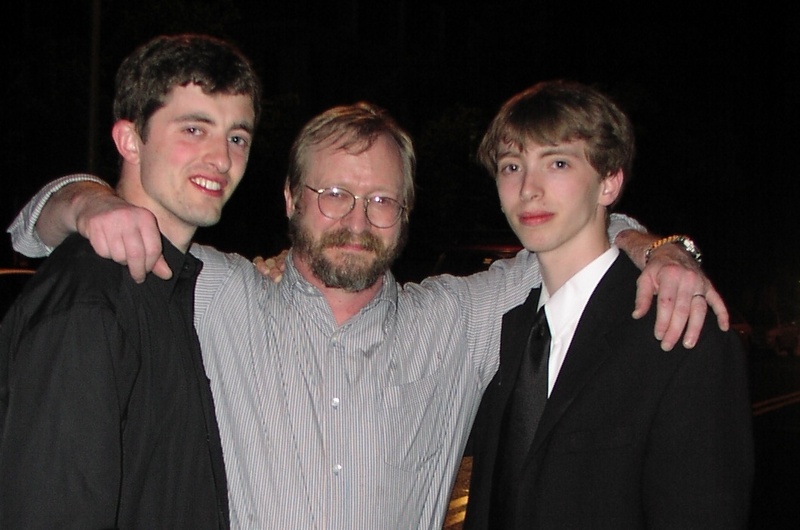 Dad and his two sons, 2003. 9. What do you love most about being a parent? When they were younger I loved providing for them and being the sine qua non of their lives. I used to go do the food shopping and I tried to bring all the provisions for the week into the house in one load so I could maximize the hunter-gatherer feeling of coming home with the kill. Now I love having two guys who really truly love me and who know me so well. It was great having kids and watching them discover the world all-new. And it’s been great watching you young men discover parenting, too. After having done it and observed it for a few decades one becomes more at ease with it and more certain of one’s own parenting. It’s fun watching you guys scratching your heads over problems I faced, too, in days gone by. 10. Last question. Your oldest son is married now, and kids probably aren’t too (too) far off. Any advice for him? Oh, I think he already knows how to make babies, he doesn’t need advice on that. He used to have plenty of picture books and magazines laying around and he learned things from movies he used to hide out in the garage so I’m pretty sure he’s up to speed on all that. Be pretty surprising if he wasn’t! As to how to raise them, I’d say do it just like me. Love the hell out of them. You’ll never regret giving a kid a hug, telling him you love him and that he’s the best. And it makes it a lot easier to guilt him into things when you need to. Remember this phrase: “You must never, ever, ever disagree with your father. you must always say ‘Yes, father’ “. Repeat intently, gravely and often. This entry was posted in The Parent Interview and tagged interview with parents, kids out of the house, other parent's voices, parenting and divorce, Spanking by Kevin Hartnett. Bookmark the permalink. Kevin… I’m intrigued! Reading the back blog entries has been a treat. GREAT questions get thoughtful and reflective answers. I’m hooked!